Note: Most links go to Facebook pages – they are usually more current than the websites. Vineyards are not new on the island, but food carts are a more recent addition. 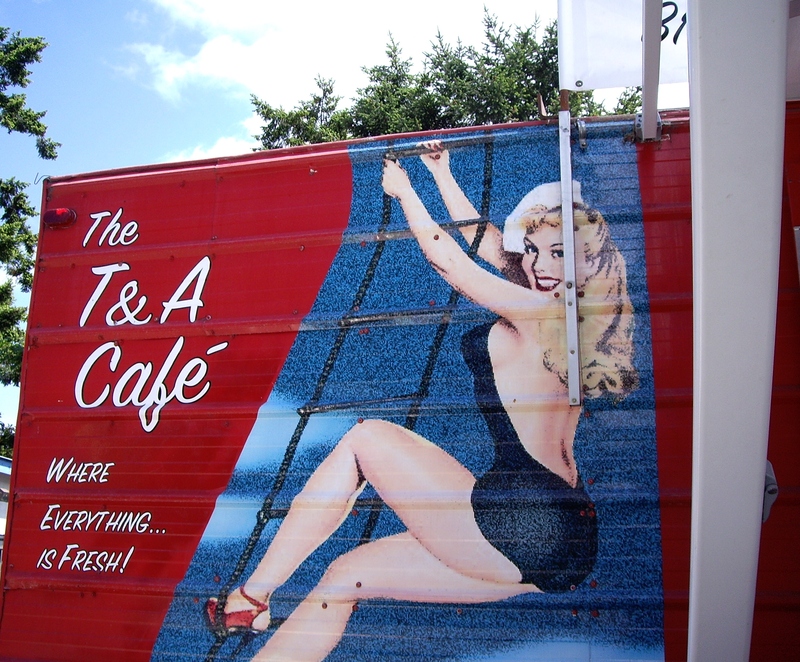 We visited the T&A Café, a colorful cart in Ganges named for the two owners, local gals with a sense of humor and a unique burger interpretation. A generous beef and pork patty is topped with homemade beet relish and tucked into a tasty pretzel bun. We had no problem polishing it off, along with fries made the way I like them – skin on and not greasy. Locals also recommend the taco cart, next to the Sea Breeze Motel off Fulford-Ganges Road, but we did not have a chance to sample their wares. Next time! Before I get to wine tasting, a few more words on food. I’ve already raved about Auntie Pesto’s in Ganges, which will not disappoint. The Tree House Cafe, also in Ganges, is a good lunch spot, though I did not visit on this trip. It’s hard to get better fish and chips than those at the Seaside Restaurant in Vesuvius. We had a family dinner there and also really enjoyed the desserts along with stunning views. In Ganges, Harlans Chocolates has yummy chocolate and very good gelato, and for a great waffle cone, stop by Glad’s Ice Cream and Sweet Shop, across from Mouat’s Hardware. (Glad’s is a seasonal business.) Old Salty’s, a gift shop, sells Crow chocolate bars, which fans of chocolate will not want to miss, along with a good selection of Roger’s Chocolates from Victoria, a venerable establishment famous for its chocolate creams. 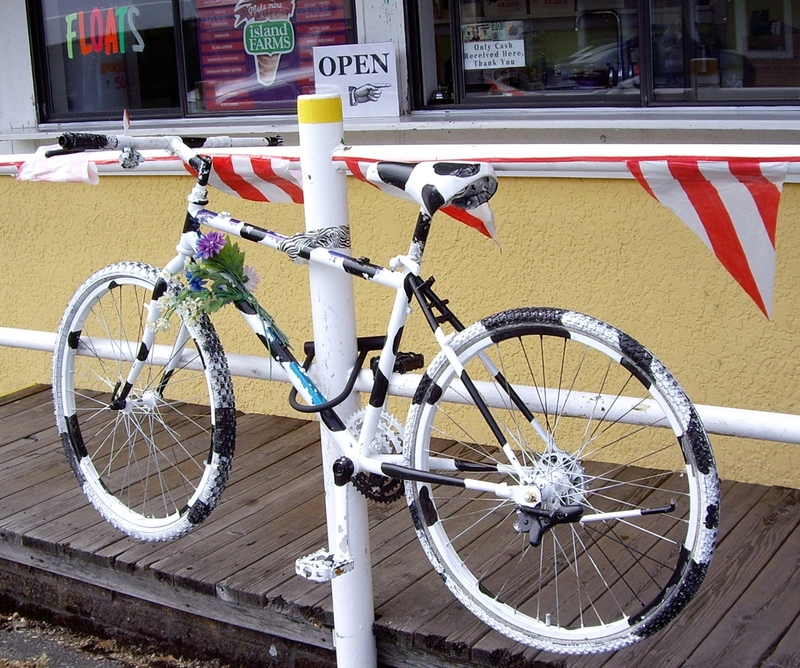 You can’t miss Glad’s Ice Cream – look for the bike! We visited two wineries and loved both. Salt Spring Vineyards and Winery is on the way to Fulford Harbour and has been pressing great wine for about 15 years, though I can remember the vines going in a few years earlier. As with so many vineyards, the grounds were lovely. I hope to add a photo to this post later from hubby’s tablet (I forgot my camera on this visit). We enjoyed the ability to sample at least eight wines without a tasting fee! We left with several bottles, including Evolution, a charming white with layers of flavor, plus an irresistible dessert wine made from heritage apple trees on the property and another made of pure blackberries, along with a bottle of merlot for my dad. The prices were good and the service friendly and informative. Mistaken Identity Vineyards is just outside of Ganges and sustainably cultivates organic vines. It has been operating for about six years and has a tasting fee of $4 for four samples. One fee is waived for each bottle purchased and believe me, you will want to buy this wine! We were unexpectedly captivated by the pinot rosé, and by the blackberry wine that was tempered with grapes for a less-sweet but richly fruity finish. We found the prices very reasonable and the service helpful, and walked out with more bottles. This winery also sells wine vinegars and other goodies, plus colorful scarves made in Guatemala. 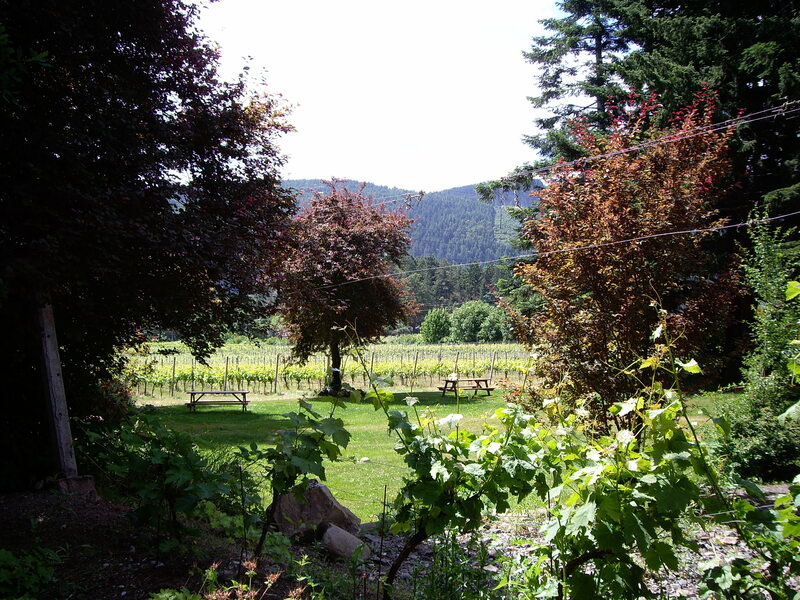 View from the deck of Mistaken Identity’s tasting room. Take your time and enjoy! 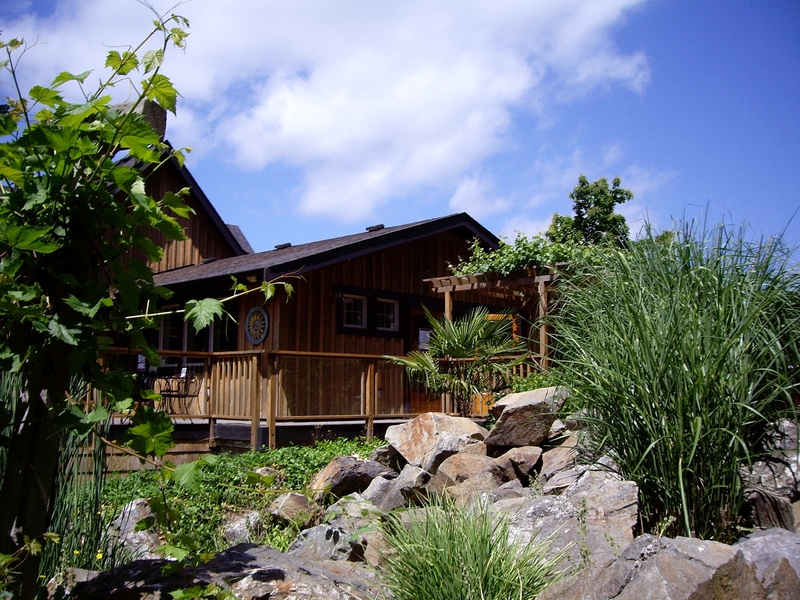 We wanted to also visit the Garry Oaks Winery, but their tasting hours are limited to weekends. They did not answer their phone for a request to visit outside posted times. Their wines are available in local liquor stores and I remember them being very good. Last time I was on island, they were not yet open for the season so here’s hoping I can catch them on my next visit! Previous Postcards from Sidney, B.C.